J Crew's double tipped Hacking Jacket retails for $298 and also comes in a few other colors. 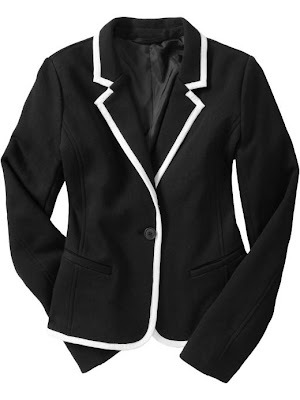 If you love the J Crew option but are looking for something a little more affordable (if you're on a tight budget), check out this jersey fleece blazer from Old Navy. It retails for $39.94 and also comes in grey. Click HERE to purchase (use code ONSAVE for 25% off thru 10/30). I love that! And right now Old Navy is having a 25% off sale!